The 81-year-old has called Italy's entry into the euro zone a "historic error" and wants a "plan B" to be drawn up to allow it to leave the currency bloc if it should prove necessary. Rome: Italian President Sergio Mattarella summoned on Wednesday a political novice who has been put forward by the anti-establishment 5-Star Movement and far-right League as their candidate to lead a coalition government. The meeting with little-known law professor Giuseppe Conte was set for 5.30 p.m. (1530 GMT) and there was no guarantee the head of state would immediately hand him a mandate to become Italy’s next prime minister. However, the anti-immigrant League indicated that they expected a swift green light from the president after more than 11 weeks of political deadlock following inconclusive elections. “The League is satisfied by Conte’s summons from the president of the republic. We are ready to get going,” it said in a short statement. 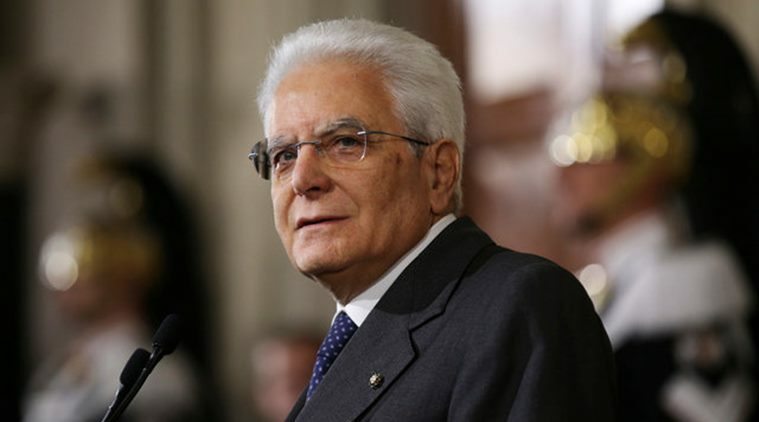 The summons came as 5-Star piled pressure on Mattarella to hurry up and endorse Conte to head the planned government that has spooked both the European Union and financial investors. 5-Star and the League told Mattarella on Monday they wanted Conte, who has no political background, to become premier. Instead of immediately accepting their recommendation, Mattarella has taken his time amid concerns about Conte’s lack of experience and suggestions he inflated his academic resume in an effort to boost his international profile. Looking to ride out the controversy, both 5-Star and the League reiterated their faith in Conte on Wednesday and openly questioned why the president was taking so long to act. “The president of the republic is not a legal clerk, but nor can he act as the defence lawyer of those who oppose change. That would be a lost cause,” Alessandro di Battista, a leading light in the 5-Star, wrote on Facebook. The League and 5-Star last week agreed on a joint coalition platform, promising to slash taxes, roll back pension reform and boost welfare in a big-spending programme that risks putting heavily-indebted Italy on a collision course with Europe. The European Commission warned on Wednesday that Italy’s financial stability was at risk from possible interest rate increases and political worries. “Given its systemic importance, Italy is a source of potentially significant spillovers to the rest of the euro area,” the EU executive said in an annual set of economic policy recommendations to Italy and the other EU member states. The Commission’s report did not address policy promises of the probable next government, but highlighted existing concerns about the state of the euro zone’s third-largest economy. “Medium-term sustainability risks remain high as the structural primary surplus is insufficient to bring about a rapid decrease in public debt,” it said, adding that Italy’s ageing population hurt the long-term fiscal outlook. Italian financial assets, which have been hit hard over the past week on worries about the political situation, continued to come under pressure on Wednesday, with the 10-year bond yield up 7 basis points at 2.40 percent, within sight of 14-month peaks hit the previous day. A partial recovery on Tuesday was checked by news the League was pushing hard for eurosceptic economist Paolo Savona to become the next economy minister. The 81-year-old has called Italy’s entry into the euro zone a “historic error” and wants a “plan B” to be drawn up to allow it to leave the currency bloc if it should prove necessary.